On this coming Saturday at the Pinnacle Bank Arena in Lincoln, Nebraska, the boxing world is about to witness something special. Fellow unbeaten unified titlists Terence Crawford (31-0, 22 KOs) and Julius Indongo (22-0, 11 KOs) are facing off in an old-school undisputed world championship fight that means all four major sanctioning body belts, namely the WBC/WBA/WBO/IBF are on the table. The Namibian Indongo and his team arrived in Omaha, Nebraska on Wednesday, August 9 after the team had spent five days in Los Angeles first. As all the hard training has already in the box for Julius, the only thing they have to look after now is the scale under the fighter. ”The hard work has already been done in Namibia so we just keep fit and keep the concentration very high as at this level you can't lose focus if you want to do well. 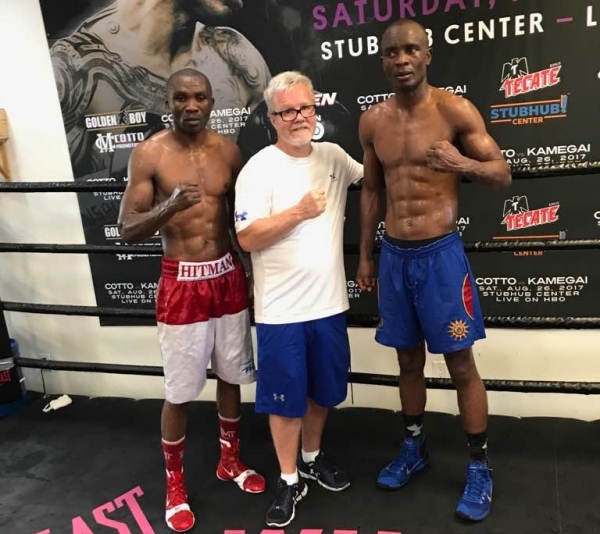 The champ looked very sharp in the final days of sparring and I am expecting fire works come Saturday night,” said Nestor Tobias, manager of Indongo to BoxingScene.com. The limit of the super lightweight division is 140 pounds. According to Tobias, his fighter is in tip-top condition so to make weight is not going to be an issue. Nestor discussed the team can feel the vibration in the air surrounding the big event with people recognizing Indongo in every corner in his opponent’s hometown, Omaha. As the Namibian contingent prepares for a tough fight, the manager has a friendly message to Crawford who is well respected by his Saturday opponent. I look forward to this fight but I learned my lesson after Postol. Crawford will win a wide decision. Hopefully Bud pushes on the gas and closes the show.